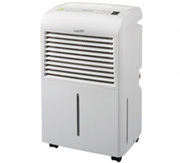 Danby dehumidifiers are among the best models available in the USA. It is for this reason that the brand is included among the select number of portable models I recommend. All Danby units are Energy Star® qualified. We have tried to provide all the information you need about the Danby dehumidifier but, if there is something we haven't covered, please feel free to ask a question. The link to the "Ask a Question Page" is in the right hand column of this page. Your question and the answer will be published here. If you provide an email address, we will let you know when it's ready and where you can find it. Among Danby's strongest rivals is Frigidaire, a brand which I rate very highly. In common with the Frigidaire models Danby dehumidifiers are good performers across the board and do not excel in one area only to fail miserably in another. The current Danby dehumidifier range includes models of 25, 30, 40, 45, 50, 60 and 70 pint capacity allowing customers to choose a model which is exactly right for an area of any size. Ideal for use in any room Danby dehumidifiers are very effective in controlling basement humidity, provided that the ambient temperature is not consistently low (below 60°F). Prices of Danby dehumidifiers vary significantly between suppliers and careful shopping will save you money. The best prices are comparable with the Frigidaire models so if you are choosing between them the choice will be a matter of your personal priorities, not cost. 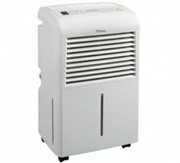 The Danby dehumidifier is a well known and popular brand comprising a range of models for home use. The company was founded in 1947 and has since grown to become one of the largest manufacturers of home appliances in North America. It markets a wide range of products including refrigerators, microwaves and cooking ranges, freezers, dishwashers and air conditioners. The DDR7009REE is a high capacity portable unit suitable for medium to large areas. It is capable of operating in low temperatures although, like all portable models, it would not be suitable for use in an area that was typically colder than 60°F. This unit is widely used in wet basements and is a popular choice for this purpose. It is particularly well suited for areas that may be inaccessible, or infrequently visited, as it is equipped for continuous drainage, avoiding the need to empty the bucket once or twice per day. It will also restart automatically following a power outage and has a remote control with a range of 16 feet. User reviews of the DDR7009REE are consistently favorable. The DDR6009REE is identical to the 70 pint model in most respects but has a lower moisture removal capacity and uses a little less power. It is well able to control moisture in medium to large areas and if you have an area that is well within its capacity the energy saving will be worthwhile. 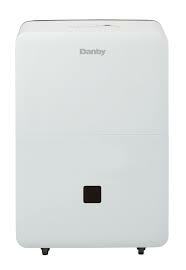 Like all Danby models, it is Energy Star® certified. Auto-restart relieves the worry of the consequences of a power failure when you are away from home and, like the 70 pint model, it is configured for continuous drainage. Outwardly identical to the 70 and 60 pint models the 50 Pint DDR5009REE is a medium capacity unit that will work effectively in a slightly smaller area to keep it free from condensation, damp, black mold and dust mites. Fitted with a continuous drainage facility the bucket will not require regular emptying if you attach a hose and run it to a nearby drain or sump. The drainage is not supported by a condensate pump so raising the unit a foot or two above floor level will increase its effectiveness. Like its two bigger "brothers" the DDR5009REE has received large numbers of very favorable reviews from users. It is equally effective in controlling basement humidity and is the ideal choice for a slightly smaller basement as it uses less energy than the larger models. The DDR45E is a new 45 pint model from one of the best known dehumidifier suppliers in the USA.This medium capacity unit is already being well received by consumers and reviews of this model are very positive. The DDR45E replaces the highly regarded 40 Pint DDR4010E which is still available for sale from some retailers and online stores. The additional 12.5% water extraction capacity of this model will reduce the daily running time of this unit in any given area which may make it more attractive to users than its predecessor. The DDR45E is an Energy Star® certified model ideal for use in moderately sized basements and other areas of your home. The company suggests that this unit will be suitable for areas of up to 2500 square feet, depending on conditions, but I would suggest that for energy efficient and effective operation it should be used in areas not exceeding 700 square feet. Despite its light weight and smaller size the DDR4010E is powerful enough to control humidity in a small to medium sized area. This unit will operate effectively in a small basement but please do not buy this or any other model for an area which is too large for its capacity. It is always safer to go one size larger to ensure protection from condensation and damp. Paradoxically buying a larger unit will often save money too. At 30 pints of water per day the DDR3010E is an economical solution to damp or condensation problems in a smaller area of the home. With fitted caster wheels this unit is easy to move from room to room. Smaller units, such as the Danby DDR3010E, are less popular with consumers than larger ones, in the 50 to 70 pint range. Larger models are more energy efficient, removing more moisture from the air per energy dollar spent, and run for fewer hours. Units of 25 to 30 pints capacity are best used in a single room within the house where a quieter, more compact unit is preferable. If the compressor never stops the dehumidifier is too small for the area in which it is being used. That being said the 30 Pint DDR3010E is ideal for use in a bedroom, for example, and some customers have been very pleased with its performance in a bathroom. Please note that this model is not protected against water splashes so should be used with due caution in bathrooms and other "wet" areas. With the smallest capacity in the range the DDR2510E is ideal for keeping a smaller area dry and at 49dB is the quietest model. The comments made about the 30 Pint DDR3010E apply equally to the DDR2510E and its capacity is likely to be insufficient for anything but the smallest of basements. With its low noise output this Danby Dehumidifier may be attractive to anyone who needs to control humidity in her/his bedroom and in that kind of space this model will be highly effective in preventing condensation.